It’s not a simple process to map and sequence the genome of an animal. 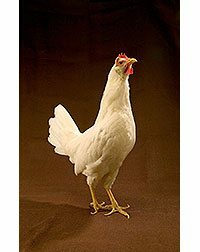 Geneticist Hans Cheng and collegues at the ARS Avian Disease and Oncology Laboratory used the DNA of the Red Jungle Fowl line combined with that of a White Leghorn chicken, similar to the one shown here, to create a genetic map of the chicken. ARS scientists are also mapping the genomes of the pig, cow, and honey bee. The test identifies roosters whose blood contains naturally high levels of two key chemicals, cytokine, and chemokines. These chemicals mobilize the birds’ innate immune response, according to ARS microbiologist Christi Swaggerty, in ARS’s Food and Feed Safety Research Unit. Using the new test, commercial poultry breeders can single out roosters that have a strong immune response and use them to selectively breed a more robust flock. Such resistance, especially during the birds’ first week of life, may lower costs related to animal well-being and food safety. Swaggerty and her colleagues study the genetics of chickens’ resistance to foodborne disease-causing pathogens, such as Salmonella and Campylobacter. Some species of these two bacteria together cause 2 to 3 million U.S. cases of foodborne illness in consumers and 450-500 deaths annually.